I'll admit it...I regularly hide beans in places where no bean has gone before (hmmm....in reading that....it kinda sounds twisted...totally not meant in a twisted way). ANYWAY, I put beans in curries, in lasagna and all kinds of places...it hadn't yet occurred to me to put them in cookies...and this is brilliant. 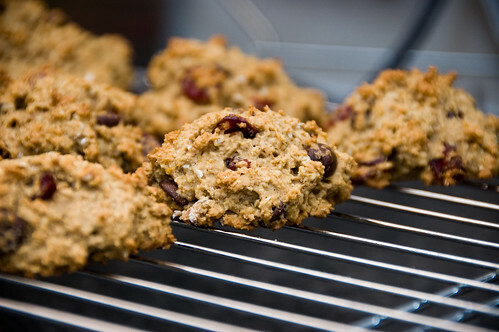 Beans, so it seems, can take the place of most of the fat in cookies. So instead of artery-clogging, calorie-rich, fatty goodness, you get a nice dose of protein and fibre. I stole this recipe from Morgan, who in turn stole it from someone else. And trust me, it's definitely worth stealing. Preheat the oven to 350°F.Place the oats in the bowl of a food processor and pulse until it resembles coarse flour. Add the flour, baking powder, baking soda, cinnamon and salt and process until combined. Transfer to a large bowl. Put the beans into the food processor and pulse until roughly puréed. Add the butter and process until well blended. 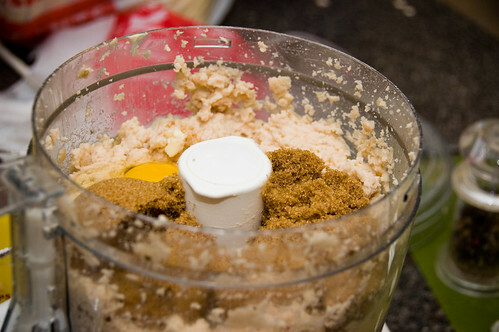 Add the brown sugar, orange zest, egg and vanilla and pulse until smooth, scraping down the sides of the bowl. Pour the bean mixture into the oat mixture and stir by hand until almost combined; add the chocolate chips, cranberries, nuts and flaxseed and stir just until blended. Drop large spoonfuls of dough onto a cookie sheet that has been sprayed with non-stick spray, and flatten each one a little with your hand. (I find this works best if I dampen my hands first.) Bake for 14–16 minutes, until pale golden around the edges but still soft in the middle. Transfer to a wire rack to cool. These were great. We shot a very very rainy wedding on Saturday and these kept us going all day! Highly recommend the recipe. They are fabulous because they are yummy and super good for you, but they don't have a crazy indulgent kind of taste, so you're not as likely to eat the whole batch. Glad you liked these! They are so unexpectedly yummy and super filling, we really love them! Gah, that just isn't right! I'm going to have to try these. I don't typically comment here, but I just wanted to say I'm glad that you're posting again. I've used your recipes for more than a few dinners! Uhoh. These are exactly my favourite kind of cookie - hearty, filled with good-for-me-stuff, and not too sweet. I may indeed eat too many today. But hey! They're good for me! Right? Hah. yea! a recipe that gives me an excuse to eat cookies for breakfast! I love when they are packed full of flavor and goodness. Nice work in reinventing your own version, great blog! SO YUMMY!!! I can't wait to try them on my 2.5 year old!! SO YUMMY!!! I can't wait to try them on my 2.5 year old!! Thank you!!! Do you by any chance know the nutritional info on these? Fat, calories, sodium? I made these last night and I agree - they are so yummy! I tried them out on my whole family and my MIL and FIL and everyone loved them. One question - do yours come out crumbly? Mine were perfectly soft, but they are crumbling to pieces. They do get a bit crumbly. Could you try reheating a bit in the microwave?